Both of those guys are certainly worth keeping an eye on for future NSX posts (they have other posts around NSX but I only included the ones above to get you to where I’m going to pick up). Note: For reference I’m going to try and use the green colors to symbolize NSX components, blue for tenant-1 components, and orange for tenant-2 components. Hosts – I have three hosts. Thumper, Thumper2, Thumper3 (you have to have interesting naming schemes right?). 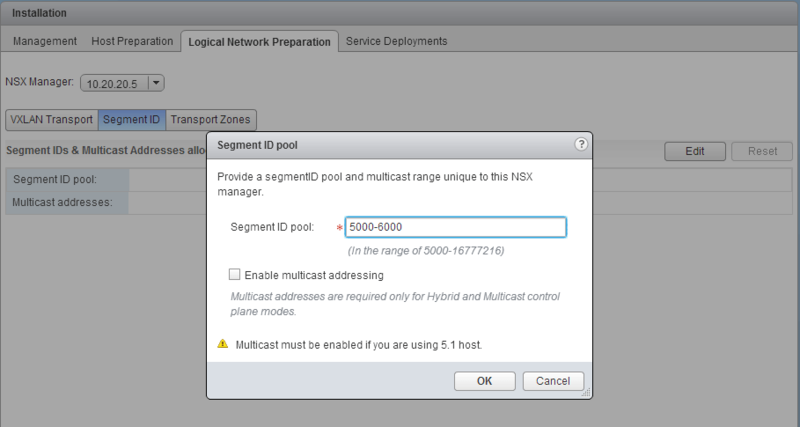 Each host is running ESXi 5.5 and is in it’s own cluster. Thumper is in cluster_mgmt and will be used for VM’s that are required for management of vSphere and NSX. Thumper2 and Thumper3 will be used for the user space guests and are in their own clusters as well (A and B). 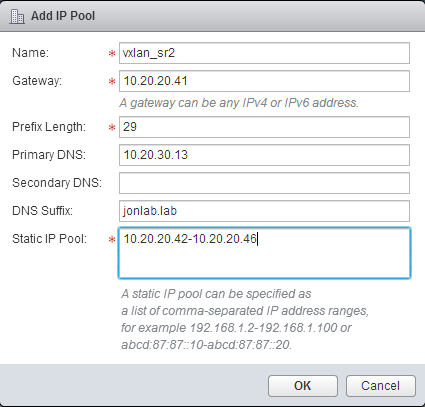 Virtual Networking – I have two standard distributed switches in the lab. The first is called ‘nsx_sr1’ and has the uplinks for both thumper and thumper2 on it. In addition, there are all the required distributed port-groups we’ll need for the guests. The second DVS is called ‘nsx_sr2’ and just has thumper3 on it. I’m trying to replicate a multiple server room situation here with 3 hosts so this is the best I could do. Physical Networking – It’s a gig switch with all of the servers interfaces being dot1q trunks allowing VLANs 115-121. Prepped the hosts and clusters – Again, I had more issues here but once I switched to the DVS and re-verified the DNS and NTP things worked for the most part. This piece was mostly just clicking and waiting. Guests – I created a web and app guest VM for each tenant to start with. They’ll just be sitting there for now until we get further along on the configuration. 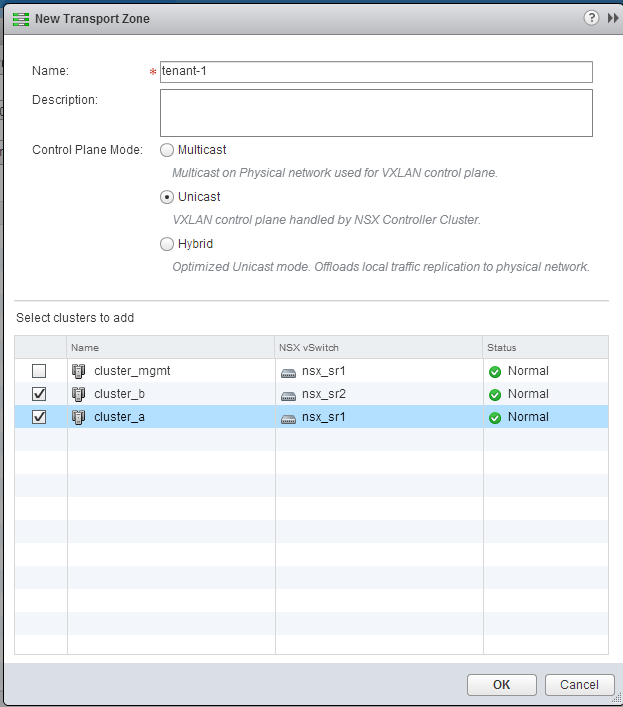 If you have multiple DVS in a particular cluster, you’ll be able to pick which one you want to use. 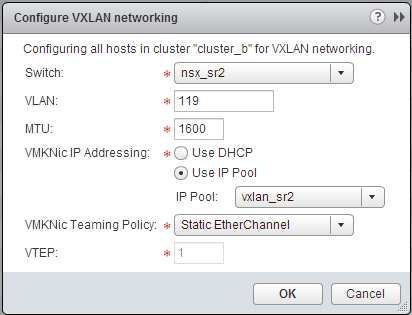 Next, you’ll need to pick the VLAN you want to use. 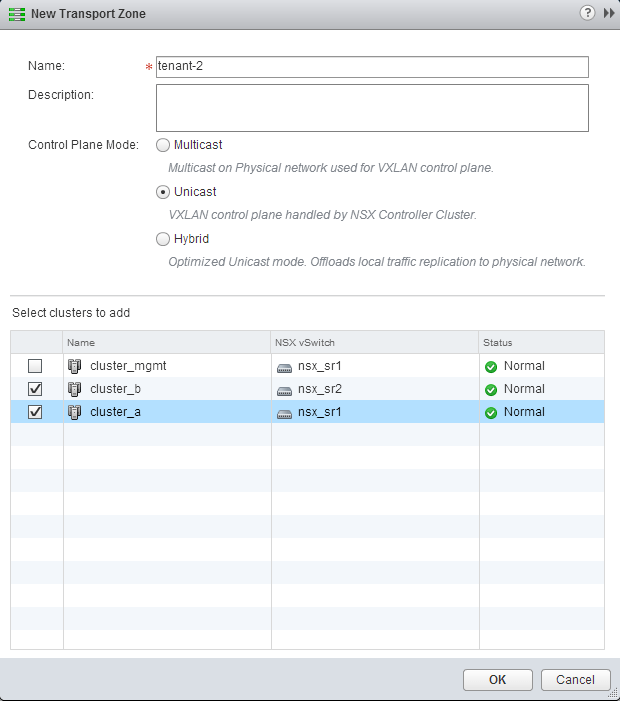 Keep in mind, what’ we’re really doing here is creating the VTEP interface that the host will use to send and receive VXLAN encapsulated traffic. Much like any other vmKernel interface, it needs to get off the host to the routed network. 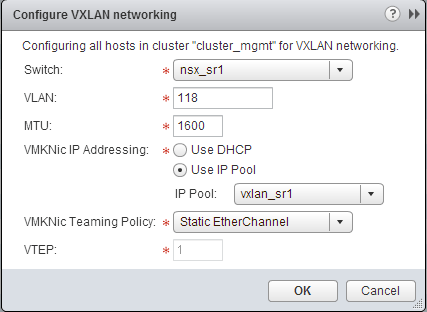 In this case, I’ve configured VLAN 118 and it’s associated interface on the upstream MLS. Frames from the VTEP will be dot1q tagged out of the host and out to the physical network. MTU defaults at 1600 to accommodate the encapsulation of the traffic. 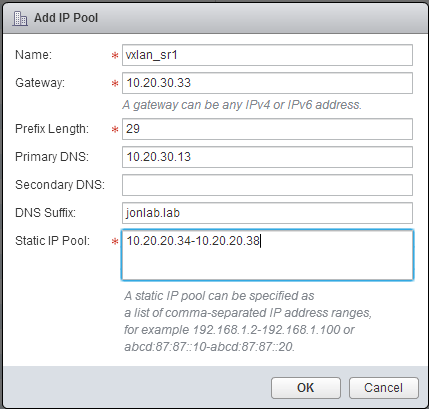 Note that the VTEP interface that we just created shows as a TCP/IP stack of ‘vxlan’ to indicate it’s the VTEP. So that’s where the segment ID range comes from. I’m not planning on having that many, so I’m just picking 5000-6000 for my segment range. Not much has changed at this point, just a couple more networks being trunked down to the servers. The next step would be to start creating the logical networks and attaching the hosts to them. I’ll tackle that in the next post along with the distributed local router configuration.